Wanna convert PDF to GIF? VeryPDF PDF to Any Converter is such a converter you can use to convert PDF to GIF. GIF file can yield a higher quality and smaller size image with icons, logos, buttons, etc and create animation effect. So, if you meet a situation to convert PDF to GIF, do not hesitate to use this efficient tool-VeryPDF PDF to Any Converter. There are two versions of VeryPDF PDF to Any Converter you can download. Here, maybe you will ask “what is GIF?” GIF, short for Graphics Interchange Format, is one of the most widely used image formats on the web, which is suitable for images with sharp edges and relatively few gradations of color such as line art, cartoons, and text. It can also create background transparencies and animations. The 1st step is to download, install and run VeryPDF PDF to Any Converter. To convert PDF to GIF, you need to download it into your computer and have it installed according to the setup instructions or have run it by double-clicking the shortcut icon on desktop. The 2nd step is to add the PDFs and click [PDF to Images]. Add the PDF files by hitting the button [Add] on top of the main panel. You can also hit the button [Delete] to delete the PDF files one by one and [Clear] to remove all the PDF files in the list. To make preparation for the next step, you need to click the button [PDF to Images] in the left column of the main interface. The 3rd step is to choose output GIF format. 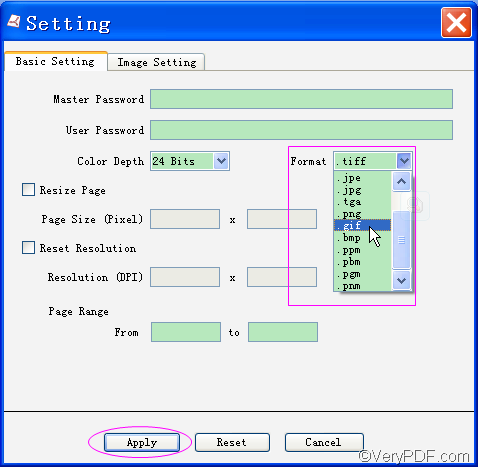 To choose the format, you need to click the button [Setting] to open the “Basic Setting” interface. Choose GIF from the format list. In order to enact the setting, you need to click button [Apply] button at the bottom of the “Setting” interface. The 4th step is to select output folder and start the conversion. Select a folder where you like for the GIF image. Then, click the button [Start] to convert PDF to GIF. Any questions about how to convert PDF to GIF, please contact our support team. For your reference, we also have VeryPDF PDF to Image Converter, and VeryPDF PDF to Image Converter for Mac, etc. You may as well have a try. How to convert documents of Microsoft Office Excel to PCL? How to convert an emf file to bmp format? Scheduled task issues, how to convert office files (Word DOC documents) to PDF files from Scheduled task? Convert prn to pcx and set resolution via command line? How to print documents of MS Office to bmp? This entry was posted in VeryPDF Blog. Bookmark the permalink.